Many homeowners love the look and the tranquility that water features offer. However, the maintenance can be an issue. How do you keep your water features clean and functioning properly? It turns out that it just takes a few small maintenance tasks to keep your water features looking and working well year round! Invest in a manual pool skimmer. One of the most important water feature maintenance tasks you can do is to regularly skim leaves and other types of debris. You probably have other filtration systems in place, but this can help them function better. Keep an eye on water levels. If you notice a big change in your water levels, this could be a signal that you have a problem with your water feature. If you think this is the case, you should consult a professional. Control the plants around your water features. Taking the time to prune branches near your water feature can make a big difference in the rest of your maintenance tasks. Water features do require some maintenance, but their return on your time investment makes them well worth the effort. They provide stress release, make your landscaping more attractive and can even increase your property value! Whether you choose to install a natural swimming pool, a fountain or a water garden, a little maintenance on your water feature goes a long way! The best news about water feature maintenance? How about the fact that you don’t have to do it alone! Our team has the equipment, training and experienced needed to provide you with affordable and effective water feature maintenance and installation. For information on how we can transform your yard, give Prestige One Landscaping a call today at (816) 925-0309. It may be chilly now, but we’ve made it past most of winter. The days are starting to get longer and we are reminded that spring will eventually return. And what better way to enjoy the outdoors then with a patio? This landscaping element is a great addition to almost any property — and for more reasons than you might expect. Increase the amount of time you and your family spend outside. Adding a patio to your landscaping gives you a better way to enjoy your outdoor living space, encouraging you to spend more time enjoying yourself outside. Make your property value increase. For a very small investment in your landscaping budget, you can install a patio that has the power to make your home much more valuable. The return on your landscaping investment is impressive when you add a patio to your home because it does not require heating and cooling and is typically not heavily taxed. Better resale value. 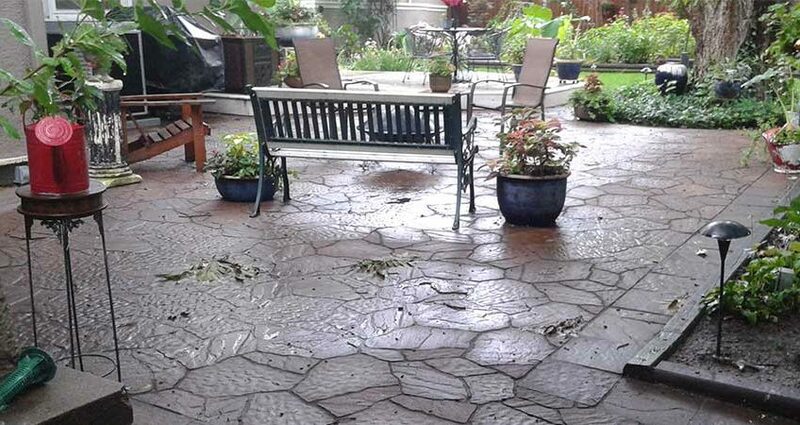 One of the top 10 features that home buyers look for in a new house is a patio. If you plan on selling your home anytime soon, adding a patio to the rest of your home’s landscaping scheme can help to ensure that you will have an easier time finding an eager buyer. Ready to start enjoying your landscaping from your patio? Prestige One has the skills and experience to through every step of the patio maintenance and installation process. Our team has the skills and experience to get you high-level results on any landscape design and maintenance project. For information on how we can transform your landscaping, give Prestige One Landscaping a call today at (816) 925-0309. More and more homeowners in the Independence and Kansas City areas are becoming aware of how water features enhance their landscape design. But exactly what benefits do you get from installing water features into your landscaping? They are great for your mental health. One of the biggest benefits of water features is the sense of peace and serenity they give to people who are around them. Stress reduction is one of the biggest benefits of adding a water feature like a koi pond to your yard. You can use them to connect to nature. Water features encourage you to get out of the house and into the natural environment. Further, they encourage wild life like birds to come to your yard, which helps you to get closer to nature. Water features enhance your property value. Not only do water features help to make your property unique, they can also increase the value of your property. They are less work than you think. Compared to a swimming pool, most water features are relatively low maintenance. Pond fountains, natural swimming pools and rain water harvesting are all enjoyable and property enhancing features that don’t cost too much and won’t force you to devote every weekend to maintenance tasks. Low maintenance is one of the big benefits that homeowners enjoy. Ready to start enjoying the amazing benefits of water features in your home or business? Prestige One has the skills and experience to help you to start enjoying their many benefits. Our team has the skills and experience to get you high-level results on any landscape design and maintenance project. For information on how we can transform your yard, give Prestige One Landscaping a call today at (816) 925-0309. It seems like winter will never end! It’s hard to even think about spring when the weather is cold. But the truth about landscape design is that the sooner you start, the better your results. Now, when the weather is chilly, is actually the perfect time for you to start your landscape design planning. Here are some tips to get you started. The most important step in landscape design planning is to get a clear idea of your needs and expectations. Do you need a play area in your yard for your kids? Are you looking at adding an outdoor kitchen to your landscaping so you can entertain outside this summer? Having a clear vision about how you’d like to utilize your outdoor space gives you focus and makes planning much more productive. Sleep on it. Landscaping choices are inherently important choices that you’ll have to live with for awhile. Don’t do your planning on whim. Instead, give yourself some time to reflect on your decision before you act. Start small. While the planning phase is exciting, it is important not to get too caught up in that excitement and overcommit to landscape design ideas that you can’t maintain or afford. Instead, choose smaller, easily obtained goals and after you reach them commit to building on them. Now is the perfect time for you to start thinking about your landscape design. Our skilled team can help with every phase of landscaping, from conception and planning to the execution and landscape maintenance. We are excited to get started on your design. For information on how we can transform your yard so that it blossoms this spring, give Prestige One Landscaping a call today at (816) 925-0309. 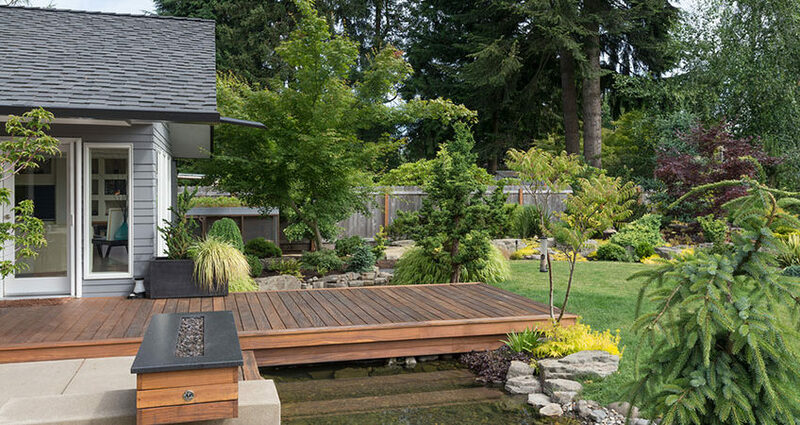 Water gardens are a great feature to add to your landscaping. These water features add a sense of serenity to your yard while giving your an opportunity to be unique. Ideally, they act as their own ecosystem, but realistically, they do need a little help. That’s why we’ve collected some of the most important water garden maintenance ideas. Keep your pump clean. This water feature maintenance task can be done by hand and is essential for keeping your water garden’s ecosystem functioning properly. You should also be aware that pumps need to be replaced regularly, so if your pump’s function seems to be compromised, consider getting a new one for your water feature. Add rooted plants to your water feature. 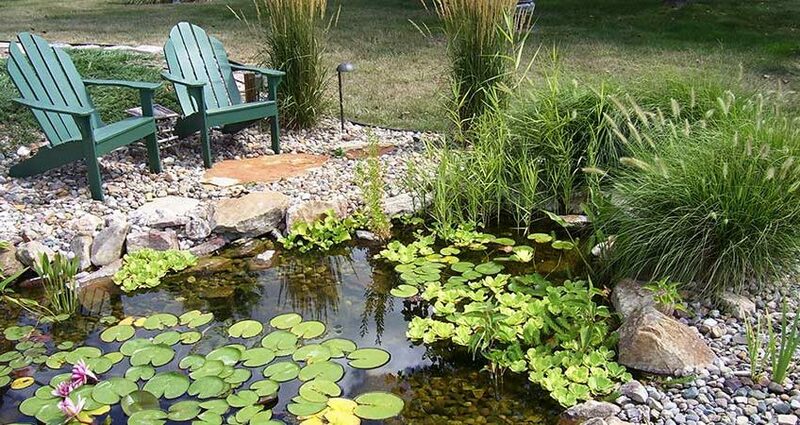 Plants not only add beauty to your water garden, they also help to regulate your algae levels. Remove debris. Once a week, you should remove leaves and other debris from your water feature with a net. This will help to keep your pump clean and keep your water feature healthy. Fight algae. One of the biggest risks to the health of your water feature is algae. Fortunately, there are things you can do to make it harder for algae to thrive in your water garden. Shade most of your water garden to keep algae in check. Work with a professional team. A water feature can be more work and maintenance than many home or business owners can spare. The best way to ensure great results from your water garden is to get advice and service from a professional team who have experience in installing and maintaining water features. For information on plants that thrive outdoors in the summer, as well as indoors in the winter, give Prestige One Landscaping a call today at (816) 925-0309. When the winter weather means you’re stuck inside, bring the wonder of the outdoors, in! At Prestige One Landscaping, Kansas City’s favorite landscapers, we have a list of favorite plants that can easily be grown indoors. Norfolk Island Pine – If you’ve got vaulted ceilings and a rustic sense of style, this plant may be perfect for you. They require lots of sunshine and a room that stays 60-75 degrees and are perfect for decorating around the holidays. Outside of the winter months, they bring a unique, yet natural and homey feel to any room. Crown of Thorns – This gorgeous plant is a traveler’s dream. At 18-24 inches tall, the Crown of Thorns blooms throughout the winter months and thrives in a cooler home. Just give it lots of bright light, and you’ll bring little bursts of color to a bleak winter. Succulents – The golden child of the Pinterest world, succulents, come in a wide variety of hardy, attractive plants. Popular options include Echeveria, Agave and Aloe (which is fire-resistant!). Many people combine several different kinds in their display, which can withstand a great deal of neglect. Perfect for those that are used to letting Mother Nature take care of their foliage. Grape Ivy – If you prefer hanging plants, grape ivy is a beautiful choice. It elegantly drapes down from the basket when kept in moderate light, moist and between 65 and 80 degrees. Like other varieties in its family, grape ivy also grows well on trellises, for a romantic effect. If you find yourself missing pops of green or flashes of color during the cold, dreary winter, consider bringing life indoors with houseplants. Now is the perfect time to start thinking about landscaping for when the weather starts to warm up this spring. Outdoor kitchens are a great landscaping feature to help you and your family relax outside and enjoy your yard. But to get the most of your outdoor kitchen, careful attention must be paid to your landscaping design. Outdoor kitchens provide the perfect combination of food and the fun. Here are a few landscaping tips for designing and effective outdoor kitchen. Choosing the location of your new outdoor kitchen is a major part of your landscaping design. You might decide to put your outdoor kitchen close to your swimming pool, under a group of trees for shade, or in close proximity to entrances to your home for easy access. Consider the pros and cons of each location and make your landscaping choices carefully. No matter how attractive your outdoor kitchen is, if you haven’t thought about the practical elements, you won’t be able to get the most out of your space. Think about inclement weather, sun vs. shade, and your ability to perform routine maintenance. Landscaping design for an outdoor kitchen that is beautiful and useful can be daunting. That’s where we come in. Along with outdoor kitchens, our experts can provide services for all of your other home landscape needs, including landscape garden planting, water features and more. Call us today for more information about our landscaping design services! (816) 925-0309! Can Good Landscaping Help You Sell Your Home? In today’s housing market, you need all of the help you get to attract potential home buyers. Fortunately, smart landscaping practices can help! Read on to learn how you can make your yard look cleaner, more attractive and much easier to sell! Ideally, you should start on landscaping a month before you plan on showing your house. That should give you enough time to get everything looking its best. These tips make it simple to boost your curb appeal with landscaping — fast! Tend to your water features. Water features can be a major selling point for potential home buyer, but only if they are in good condition. But if your natural swimming pool or koi pond is not well-maintained, it can make the rest of your home look less valuable. So if you have been lax on maintenance, it is definitely worth your time to spruce up your water features to improve the overall look of your landscaping. Add seasonal plants. A pop of color from a flowers makes your home look more inviting. Even if you don’t have any planted in your landscaping yet, it isn’t too late! There are plants that you can add to your landscaping year-round that can dramatically improve the appearance of your property. A little pruning goes a long way. One of the easiest and most important landscaping tasks that you can do when you are trying to sell your home is to make sure that your trees and shrubs look well maintained. A small amount of time spent shaping can make a big difference in the overall appearance of your yard. All of the tasks that you need to do to keep your property in top shape and ready to sell can be daunting. That’s where we come in. Along with the latest landscaping trends, our experts can provide services for all of your other home landscape needs, including landscape garden planting, outdoor kitchen landscaping and more. Call us today for more information about the newest landscaping trends! (816) 925-0309! Whether you’re in a rural or suburban location, deer can be a threat to your landscaping efforts. The damage that deer can cause to your landscaping can be substantial. Here are a few ways that you can keep deer away from your trees and other plants. 1.Consider a fence – One of the most effective ways to keep deer from harming your property is to build a fence. The most effective fences are around ten to twelve feet tall (deer can really jump!). 2. Use soap to protect your landscaping– Deer are put off by the smell of bar soap, making it a safe, affordable and environmentally friendly way to protect your yard. If you hang soap in your trees, you can expect to see a dramatic reduction in deer traffic. 3. Human hair is a surprising repellent – Strange as it may sound, deer do not like the smell of human hair. You can acquire scraps of hair at salons, stuff the hair in pantyhose, and hang them in trees among your landscaping. 4. You may need a commercial solution – If you’re serious about keeping deer away, you might want to consider a commercial repellent. Just follow the manufacturers directions exactly and remember that you’ll need to reapply the repellent after a few days or a heavy rain. 5. Add Deer-Resistant Plants – For the most green solution possible, think about plants that do not appeal to deer for your yard such as Allium, Artemesia, Clethra, Digitalis, Lavender, Monarda, Regosa roses, Santolina and others. This way, you can enjoy beautiful landscaping without being concerned about the constant maintenance that other deer-proofing solutions might require. With some planning and thought, you can find solutions to keep deer from destroying the beauty of your landscaping. Along with customized landscaping design, our expert team can provide services for all of your other home landscape needs, including landscape garden planting, outdoor kitchen landscaping and more. Call us today for more information about landscaping solutions! (816) 925-0309! As we get closer to the holidays, many homeowners are thinking forward to warmer weather — and the landscaping opportunities that accompany those warmer days. The new year brings new opportunities and new trends in landscaping. Ready to find out what they are? 1. Gardens that are both beautiful — and edible. Modern homeowners are looking for landscaping options in their gardens that will allow them to enjoy the beauty of a cultivated garden while also being able to harvest homegrown fruits and vegetables. Chili peppers, tomato plants and other vegetables are planted among ornamental plants to create a cohesive and cultivated landscaping effect. 2. Creature-friendly landscaping is increasing in popularity. More homeowners are looking to welcome wildlife into their yards in 2015. And landscaping can help to encourage birds, butterflies and bees. Adding certain plants to your landscaping can help to attract butterflies and bees, while access to water in the form of birdbaths will bring more feathered friends to your yard. 3. Let plants help you get more privacy from your landscaping. With more homeowners interested in outdoor living in 2015, there is growing demand for greater privacy when enjoying the great outdoors. Many landscaping experts are answering this demand by creating screens with any combination of trees, shrubs and vines, allowing homeowners to fully enjoy their outdoor spaces without worrying about being observed by neighbors or passersby. Ivy and Japanese holly are popular landscaping options for homeowner looking to use landscaping to increase privacy. Along with the latest landscaping trends, our experts can provide services for all of your other home landscape needs, including landscape garden planting, outdoor kitchen landscaping and more. Copyright 2010 - 2017. Prestige One Landscaping.